At first glance, the Trans Mountain Expansion Project appears to be the latest pipeline to enter political limbo. The project was approved, and then it wasn’t. Recent events, however, indicate that the project is headed toward resuming construction. The Trans Mountain pipeline was developed by Kinder Morgan’s Canadian division more than 65 years ago. The pipeline was established on March 21, 1951, when the Canadian Parliament granted the company a charter. The pipeline went into service on Oct. 17, 1953, with the first shipment of oil reaching the Burnaby Terminal in British Columbia. Trans Mountain has served as a key transportation link between the Alberta oil sands and the West Coast ever since. Trans Mountain is currently North America’s only direct access to western tidewaters for export, according to spokesperson Ali Hounsell. The pipeline is also rare in that it provides batched service, transporting crude oil and refined products from Alberta to the coast for local use and export to Washington state, California and destinations beyond. The expansion is essentially a twinning of the existing 1,150-km Trans Mountain pipeline, increasing system capacity from 300,000 barrels per day (bpd) to 890,000 bpd. 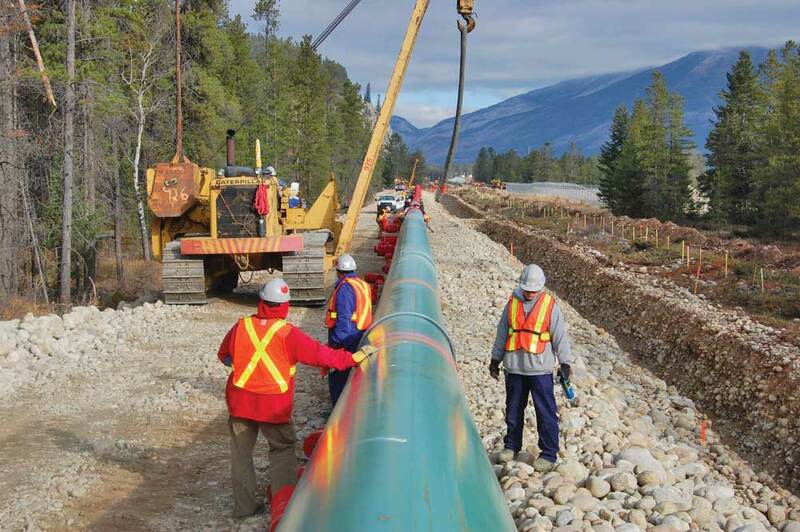 The project is expected to cost approximately $7.4 billion (CAD), with an estimated 980 km of new pipeline. Existing right-of-way accounts for 73 percent of the route, while 16 percent will follow other linear infrastructure such as telecommunications, electrical or highways, and 11 percent will be new right-of-way. The existing pipeline will carry refined products, synthetic crude oils and light crude oils with the capability for heavy crude oils. The new twinned pipeline will carry heavier oils with the capability for also transporting light crude oils. Trans Mountain has already secured interest from 13 shippers that have signed long-term contracts for the added capacity. These shippers have signed 15- and 20-year commitments, accounting for about 80 percent of the expansion capacity. 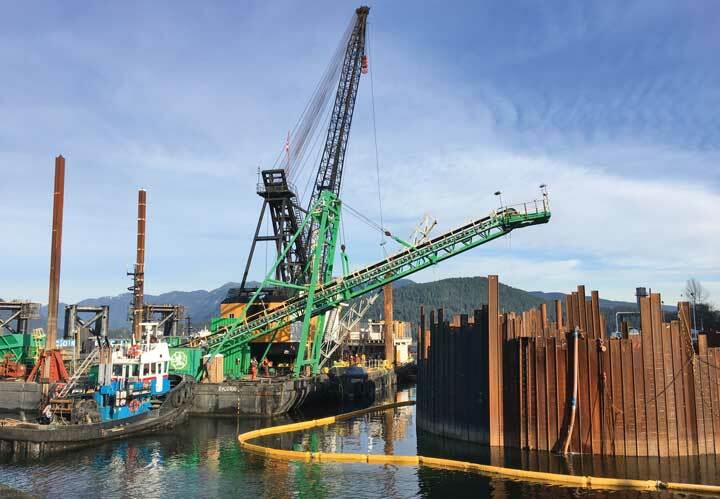 The project will also include 12 new pump stations, 19 new tanks to be added to the existing storage terminals in Burnaby, Sumas and Edmonton, while three new berths will be built at the Westridge Marine Terminal in Burnaby. Once the new berths are completed and in service, the number of tankers loaded at the terminal could increase to approximately 34 per month. The marine terminal is one of the most important aspects of the expansion in terms of customer demand, but Hounsell adds that it’s also the most contentious. Kinder Morgan received federal approval to proceed with the Trans Mountain expansion in November 2016, and the British Columbia Environmental Assessment Office (BC EAO) issued a certificate allowing the project to proceed in January 2017. But then the project began to encounter difficulties. In April 2018, Kinder Morgan announced it was suspending activities related to the Trans Mountain expansion after strong political pushback from the British Columbia provincial government. The Canadian federal government stepped in and announced May 29 that it would purchase the pipeline system for $4.5 billion (CAD), with the stipulation that the executive team that managed the Trans Mountain system under Kinder Morgan would remain in place. The deal was finalized by the end of August. Everything appeared ready to move forward. But then everything changed. Since the end of the August 2018, the NEB has been reviewing the marine shipping aspect of the Trans Mountain expansion. That review concluded earlier this year. The NEB delivered its reconsideration report to the Canadian government on Feb. 22, with an overall recommendation that the project remains in the public interest and should be approved. Canada’s energy industry applauded the NEB’s decision. The Canadian Association of Petroleum Producers (CAPP) called the recommendation “a crucial, but not surprising” step toward the completion of the Trans Mountain expansion. The Canadian Energy Pipeline Association (CEPA) called the NEB “the best-placed regulator” and touted the board’s expertise in delivering a comprehensive report within the mandated timeline. “It is now in the government of Canada’s hands to complete their consultation, consider the report and render an approval in a timely fashion similar to the requirements put on the NEB,” said Chris Bloomer, president and CEO of CEPA. The Trans Mountain expansion includes upgrades to the Westridge Marine Terminal in Burnaby, British Columbia, which would allow increased tanker activity. The marine terminal is one of the most important aspects of the project, but also one of the most contentious. If the project is approved, the NEB will impose 156 conditions on the project and has made 16 new recommendations to the government related to matters that fall outside of the NEB’s regulatory mandate, but within the authority of the government of Canada. These recommendations relate to impacts on the Southern resident killer whale population and associated indigenous culture use related to the orcas, as well as a number of other issues related to the marine environment. Despite all the recent challenges, Hounsell doesn’t see opposition rising in Canada when it comes to oil and gas pipeline development. Now, Hounsell sees more of an “energy literacy” that has forced Trans Mountain to start from scratch in managing public outreach. However, educational efforts to build awareness and explain the safety aspects of the project have paid off. The Canadian government has 90 days under NEB rules to act, which would place a deadline of May 23 on the final decision.